Bulma: Guys! i found info about our movie on the internet! 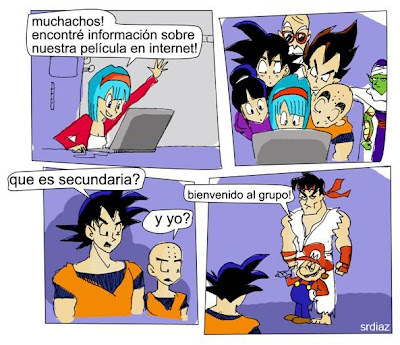 Goku: "High school"? What is that? Mario: Welcome to the club! Nice! I kinda want to challenge some DBZ sites as well. Some of them support the film. Though, they contradict themselves when they bash the original ocean-dub for editing and cutting out episodes, which really wasn't Ocean's doing since they were contracted by the producers who tell them what they want done. So yeah, I think the protest message needs be taken to the largest source DB.DBZ viewing. Even befriend site owners and see if they would kindly spread the meassage. No problem, I'm going to try to finishes it today, it's already drawn I just have scan it of course spruce it up with my ancient art tools... I'm so behind in technology, (sighs). Hadn't had much time at home and parties seem to get in the way, hoepfully not today. BTW new one! I SAID I'M GONNA BUILD THE MONUMENT TO THIS GUY IF THIS IS TRUE! CAUSE THATS WHAT I WANTED TO DO LONG TIME AGO! did trunks brought this paper from the future? This is the sixth part of his video serial "Dragon Ball movie thoughts" so if you wanna see them all definitely check out his youtube profile. Everything he said can be found on this forum, I'm so happy to see more and more people who share our opinion. Oh this just made my day! ^Yes thats why I really respect him, he really thinks reasonably and as a pure fan. And yeah he pretty much said all we usually say, he definitely gotta come here! Do you hear me Geoff! if you're reading this topic(I gave you link ), then join us right now! You should put Shadic23's rant up, by far the most awesome! Okay, here's my f-you to Dblam! Still I don't like Robert Dodril's version of DB as he will place Goku as a 15 year old and place Gero already. Plus I have a similar idea of placing the Red Ribbon along with Piccolo, but if I say it, he will say I stole it from him. Plus he is mad at me because I am mad at his girlfriend. What Robert is making his movie? Ok I understand that you're mad at each other but, as long as its not anything serious like, you can always bury down battle axes its on you two to decide whether its right or not. VEGETA_DTX wrote: What Robert is making his movie? No, as far as I know, he wants to do his version in the future. As for Robert and I, I am not even sure on how things are going. I told him to contact me here to talk about it, but so far, he hasn't came. but I think everything should be ok.
Well, in five days that official trailer comes out, they will no doubt try to impress after that test debacle was released. Only then will we see where we truly stand, and a devilish presentation will make some break weak and surrender and go back to wanting to see the movie. The rest will stay loyal and move on. ^Well, for the real fans there is no such thing that can save them now, they really blew it...They can only pray that they will hold on to those for the movie "fans" or win back those that were in favor of the movie at some point. Thank you very much Sephi!!! VEGETA_DTX wrote: Thank you very much Sephi!!! I'm glad that you like it, and bring as more sign.